This easy strawberry mold recipe is just that: EASY! EASY! EASY! Prepare this for tonight's dessert and your family will thank you! Dissolve gelatin in boiling water. Stir thoroughly. Add the lemon juice, water and juice from the berries (should equal 3 ½ cups) and continue stirring. Allow to set until slightly thick. Add berries and beat until fluffy. Pour into an 8 cup greased mold. 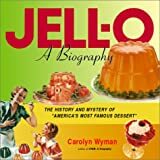 For more jello mold recipe ideas, visit Amazon.com for a wide selection of quality cookbooks. Sign up today for an easy way to keep updated on all things strawberry. New recipes, readers' comments, gift ideas, trivia, tips and more! Thanks for visiting easy-strawberry-recipes.com, your one-stop source for all things strawberry.